Whether managing appendicitis as an urgent rather than an emergency procedure is associated with an increased risk of adverse events is controversial. In this study across 23 children’s hospitals, risks of complicated disease and postoperative complications were examined with time to appendectomy within 24 hours of hospital presentation. Among 2429 children, a delayed appendectomy was not associated with adverse outcomes. The accompanying Editorial underscores that the patient’s clinical status combined with the availability of resources defines optimal management for children with appendicitis. Two-thirds of individuals receiving treatment for opioid use disorder had their first use before age 25 years, and one-third before age 18 years. Hadland et al used a national commercial insurance database to examine youth with opioid use disorder who received buprenorphine and naltrexone. While medication use increased between 2011 and 2014, only 1 in 4 youths received 1 of these drugs. 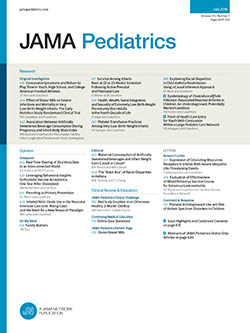 The accompanying Editorial discusses the low rate of medication-associated treatment among these youth and needed changes in practices and policies. The prevalence of e-cigarette use has risen since 2007. This systematic review and meta-analysis addresses whether youth who use e-cigarettes are more likely to smoke cigarettes and the effect of e-cigarettes on youth who currently smoke. The study found that e-cigarette use was associated with a 3.6 increased odds of subsequent cigarette smoking and a 4.3 increased odds of past 30-day cigarette smoking. Regulatory action by the US Food and Drug Administration will be needed to discourage youths from using e-cigarettes. Finding effective treatments for bronchiolitis has frustrated clinicians and investigators. This multicenter randomized clinical trial tested whether treating infants with bronchiolitis with nebulized hypertonic saline would decrease the rate of hospital admissions. There was no difference in admission rates between groups, and hypertonic saline use was associated with mild adverse events, such as a worsening cough. The accompanying Editorial by Ralston suggests that is the last word on using hypertonic saline for bronchiolitis. Effective interventions at the local pediatrician and community level for children with obesity are limited. In this randomized clinical trial, Taveras and colleagues tested an enhanced primary care intervention against the same care with individual health coaching for children with obesity in 6 primary care practices. There were significant improvements at 1 year in body mass index (calculated as weight in kilograms divided by height in meters squared) z score in both intervention groups, but no statistically significant differences were found between the 2 interventions. The intervention components were deliverable, acceptable to parents, and did not adversely effect how parents perceived their children’s health care.